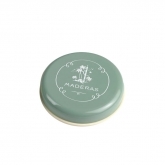 Maderas de Oriente is born in an approach to the Orient, its culture and over all its magic and phantasy, a combination of the lush Jazmín de Palacio with Rocio de Flor de Azahar, exotic woods splintered under a crescent moon and a deep treasure, the Ambar Gris. The brand is born in 1917 at the hands of the Myrurgia house: perfumery founded in Barcelona by Esteve Monegal and Prat. Got a very important presence not only in Catalonia soil, but also in international markets, with products such as – colognes, soaps, perfumes – that counted with the oriental charisma (“Maderas de Oriente”), the hyspanic exotism and also clear hedonists evocations.